The lifestyle and food culture celebrated on an estancia, a large South American vineyard estate, is the inspiration for Victor Albisu’s flagship restaurant in the Chinatown neighborhood of Washington, D.C. The airy, 174-seat agrarian space is home to a meat-driven, wine-centric menu that is a product of Albisu’s Latin American roots and travels throughout Argentina, Chile, Peru, and Uruguay. An extensive selection of steaks and various slow-roasted meats served with vibrant herb sauces, such as chimichurris and fresh salsas is the backbone of Del Campo’s menu. Albisu’s Peruvian heritage shows itself in the form of a Latin raw bar of ceviches, tiraditos and crudos. The wine program leans heavily towards South American varietals, which are decanted in traditional Argentinean carafes. 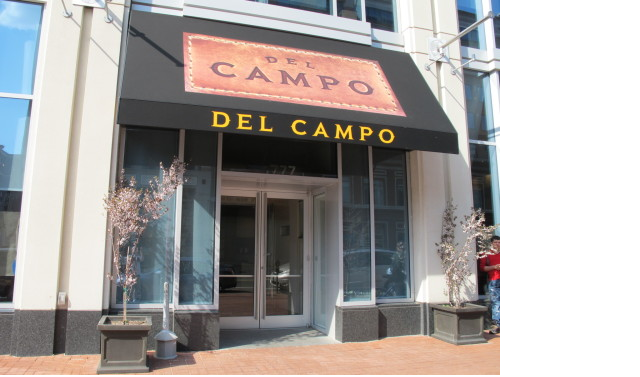 Del Campo is open for dinner seven days a week. A nine-seat asado bar offers guests a front row view of the gallery kitchen’s open flame. In addition to the dining room, guests can enjoy pisco sours and caipirinhas at the bar along with more casual South American street food. Albisu offers his take on Argentine sandwiches, chivito and chori-pan, as well as Peruvian skewered and fried meats, anticuchos and chicharones. Albisu also owns Taco Bamba, a Mexican street food-inspired takeout counter in Falls Church, VA.
Del Campo opened in the former PS7s space back in April 2013. You can see their their menus here. Any fans? Any must order items?